The field of Artificial Intelligence (AI) has been going through a period of rapid acceleration in recent years driven by Machine Learning (ML). Furthermore, the meteoric rise of Deep Learning (DL) technologies has had a dramatic impact across industries from finance to healthcare to manufacturing. The emergence of ML has also disrupted the physical security industry. For example, now we can take advantage of DL technologies and video data analytics to solve some difficult problems. This is evidenced by recent events in China where 25 wanted criminals were caught with the help of smart video surveillance with facial recognition at a beer festival. 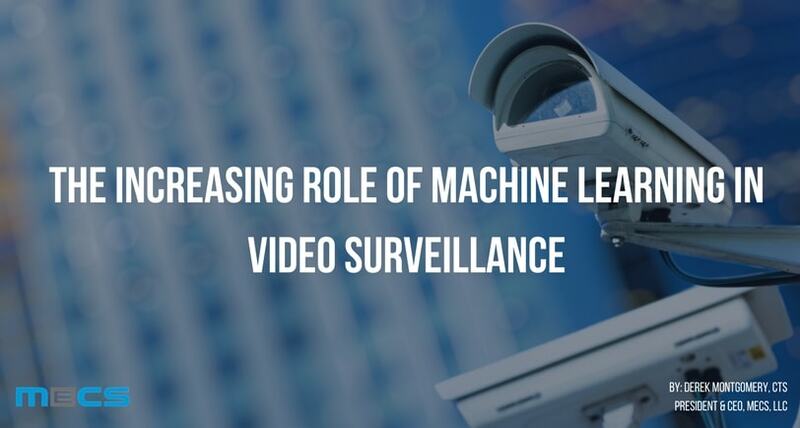 How does ML enhance video surveillance? Just five years ago, computers were unable to recognize many different types of images until an algorithm was developed by Alex Krizhevsky. This form of math function that enables filtering became known as Convolutional Neural Networks (CNNs). Fast forward to 2017 and we now have ML-based video surveillance that performs analytics to determine the next best step to better secure your business and increase security. This is achieved by automatically analyzing hours of data to identify unusual patterns and potential threats (and significantly reduce false alarms). However, this technology has the potential to do a lot more for your business by creating new opportunities. For example, in the retail sector, AI can perform tasks like counting people to identify areas with the highest point-of-sales. This technology can also be utilized to determine how many staff members are required for each store. What’s more, point-of-sale video analytics can also go a long way to help businesses reduce the risk of fraud and have a positive impact on their bottom line. What are the key advantages of ML-based video surveillance? The primary benefit of ML-based algorithms over legacy computer vision algorithms is the fact that DL systems can engage in training continuously (in real-time) to improve with more and better data sets. The same cannot be said for rigid computer algorithms that are plagued with false-positive detection events. As these ML-based DL systems are currently in their infancy, you can expect them to continue to evolve and detect domain-specific events that are unique to security-oriented environments. Furthermore, DL-based video searches can help cut down (what used to take) hours of work to just minutes, making the management of security resources more efficient and effective. As a result, enterprises across industries have the potential to save money while reducing the need for increased human intervention. The continued acceleration within the ML-based video surveillance space has also changed the way physical security is managed. Today, video surveillance is equipped with robust tools for real-time event response, not just for forensic purposes. To learn more about how you can secure your business with ML-based video surveillance and analytics, click HERE to schedule a consultation with one of the experts at MECS.